Pope Francis holds a palm frond as he celebrates a Palm Sunday Mass in St. Peter's Square at the Vatican, Sunday, April 14, 2019. "On Palm Sunday, palms are blessed and distributed in remembrance of Jesus' triumphal entry into Jerusalem", said Fr Nigel Barrett, spokesman for the archdiocese of Bombay. Speaking with Vanguard at the Holy Cross Cathedral in Lagos, the Catholic Archbishop of Lagos, Alfred Adewale Martins said: "Whatever the challenges or the conditions we are passing through, we must persevere just like our Lord Jesus Christ did and not forget that there is always glory at the end of every life challenge". 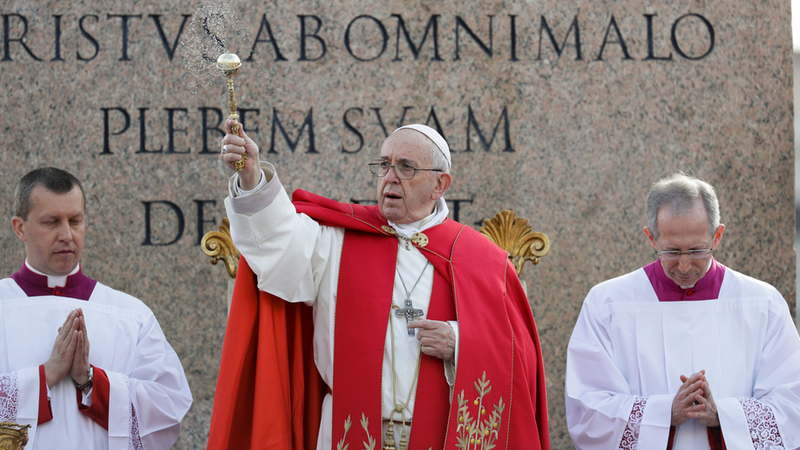 Pope Francis during Palm Sunday Mass in Saint Peter's Square, at the Vatican, Apr. 14, 2019. On Good Friday he will lead the Way of the Cross procession at Rome's ancient Colosseum.